Here's a Christmassy twist on Biscotti with cranberry, cinnamon and orange zest drizzled with dark chocolate to make them extra special. They are very easy and make lovely homemade Christmas gifts wrapped in cellophane. Line a large baking sheet with baking paper and dust with flour. Whisk the eggs and sugar in a large bowl until light and fluffy. Add the flour, orange zest cranberries and cinnamon. Mix everything together to make a soft dough. If it's a little sticky then add a little more flour. 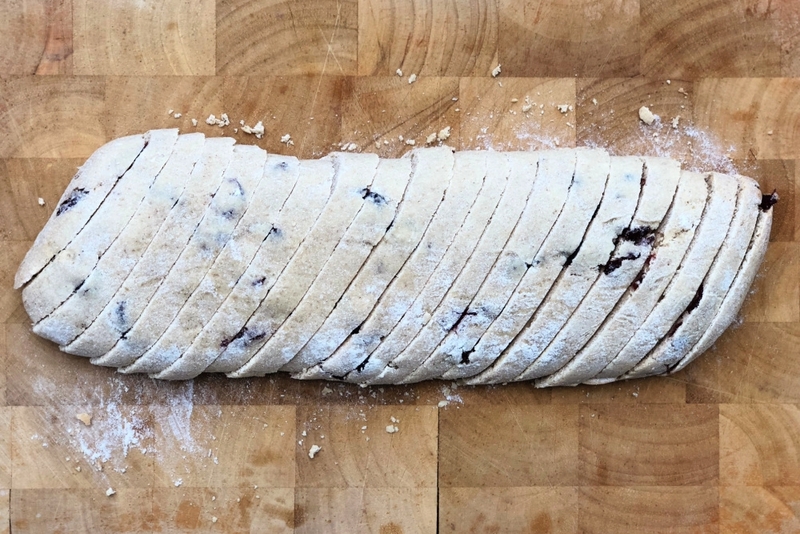 Tip the biscotti dough onto the floured baking paper and shape into a rough parallelogram (see photo below) approximately 25cm x 10cm in size, and 3cm thick. Bake for 30 minutes until lightly browned on top. Remove from the oven and reduce the temperature of the oven to 160 C / 140 fan / gas mark 3. Slide the part-baked biscotti onto a chopping board and cut into 20 - 24 slices approximately 1cm thick. Slice on the diagonal (see photo below for details). Return to the baking sheet, cut-sides up and bake for around 20 minutes until crisp. Cool on a wire rack. Put the chocolate into a food bag and put the food bag into a mug of recently boiled water to melt it. Snip the corner of the food bag to make a little piping bag and use it to drizzle the chocolate over one side of the biscotti. Leave to harden before serving.